The Pepperdine Digital Commons at the Pepperdine Libraries is now live, providing a centralized platform for Pepperdine journals, faculty webpages, conference proceedings, student research, and e-scholarship. The collection aims to make Pepperdine’s scholarly output accessible, secure, and search-engine-optimized for online discovery. Top Digital Commons downloads so far include papers by students and faculty, with topics ranging from the government’s bailout plan and the book of Psalms, to the economic status of the real estate market. The Pepperdine Digital Commons is a digital repository and publication platform designed to collect, preserve, and make available the academic output of Pepperdine faculty, students, staff, and affiliates. Features of the new site include SelectedWorks pages—a personalized faculty webpage with full texts of their work, as well as a place to showcase selected graduate and undergraduate scholarship. 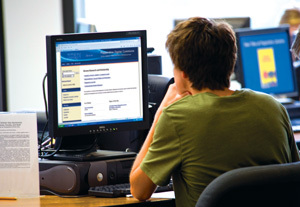 It is the mission of Pepperdine Digital Commons to facilitate the discovery of the University’s scholarly communications, provide instant access to full-text works, and preserve these materials in an open, digital environment.